Great for a Hen’s NIGHT! 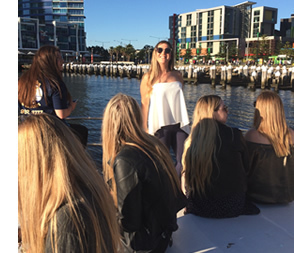 An exclusive three hour Party Boat Cruise is the perfect way to spend your Hen’s day or night in Melbourne! Picture this – cruising Melbourne Docklands and the Maribrynong River on your own exclusive party boat. Let your hair down or kick back and relax, its entirely up to you. Use our Food Package or organise you own catering - up to you.